We have been involved with the buying and selling of homes in the central PA area for almost 33 years. Since inception, we have been an important part of the local community, and we will continue to serve all of the area's real estate needs for years to come. Our agents work under an experienced licensed broker, Jim Collins (License #RB-060252-C), and are high caliber professionals with extensive experience and knowledge about our local real estate market. Our agents come from diverse backgrounds but all are dedicated to providing the highest quality service to our clients. Meet Our Agents! Our office is fully equipped with an integrated network of computer and communication systems. We have instant access to the Bright Multiple Listing Service*, Public Record Searches, and many other tools and services that our agents use to better serve you. *The Bright MLS is made up of nine forward thinking MLSs (43 Associations) in the Mid-Atlantic region. Bright serves parts of 6 states plus Washington, D.C. encompassing 85,000 real estate professionals who serve over 20 million consumers and facilitate approximately 250,000 transactions a year that are valued at more than $85 billion. Our licensed administrative assistant works tirelessly to accommodate any and all of your needs, and helps coordinate meetings, set schedules, and ensures the timely processing and delivery of all your documents. 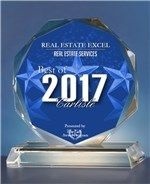 For the ninth consecutive year, REAL ESTATE EXCEL at 1224 Holly Pike Carlisle Pa.17013 has been selected for the Best of Carlisle Award in the Real Estate Services category by the U.S. Commerce Association (USCA). Nationwide, only 1 in 1000 (less than one-tenth of 1%) 2017 Award recipients qualified as Nine-Time Award Winners. Various sources of information were gathered and analyzed to choose the winners in each category. The 2017 USCA Award Program focuses on quality, not quantity. Winners are determined based on the information gathered both internally by the USCA and data provided by third parties.